John Collins was born into a family that was determined to serve their homeland and that affected the way he was brought up and nurtured. He is an American professional basketball player who plays in the National Basketball Association for the Atlanta Hawks. His position on the court is the power forward. We will discuss who he is, what he does and some facts that you may need to know about him. There are a few people who bear the name, John Collins and just like some of them, this John Collins has done quite well for himself. He was born on the 23rd of September, 1997 in Layton, Utah to a couple in the military. His parents are John Collins Jr. and Lyria Rising-Collins. His father served in the Navy while his mother was in the Air Force. Collins attended Cardinal Newman High School in West Palm Beach, Florida and he was a three-time letter winner while he was there. He was also named to the Florida Class 4A Player of the Year during his final year. When the time came to make a decision about college, Collins chose to side with Wake Forest. During his freshman year at Wake Forest, he appeared all of the 31 games his team played leading the field goal accuracy with 54.7%. Having turned up in 31 games and starting just one of those games, he ended up averaging 7.3 points, 0.2 assists and 3.9 rebounds per game. In his second year, his sophomore year he had a team-high scoring record of 19.2 points per game. He also averaged 0.5 assists and 9.8 rebounds per game as well. By the end of that second year, Collins was recognized by being named to the ACC Most Improved Player and also the first-team all-ACC. After two years of college basketball, Collins entered for the 2017 NBA Draft and ended up selected as the 19th overall pick by the Atlanta Hawks. Collins took part in the Summer League of 2017 and earned All-Summer League First Team honors due to the performances he put in. During the five games he played in, Collins was averaging 15.4 points, 9.2 rebounds and 1.0 assists per game in 23.1 minutes of action. More preseason action came with appearances in all five of Hawks’ games with an average per game of 7.6 points, 7.0 rebounds and 0.6 assists, all in 19.2 minutes. Also Read: Who Is David Nwaba – The Nigerian American Basketball Player? In a 116 – 104 loss to the Brooklyn Nets, he recorded his first career double-double with 14 points and 13 rebounds. Another double-double followed in quick succession as the next night against Miami Heat, he scored 14 points and 11 rebounds in a 104 – 93 loss. He recorded a career-high 21 points in a game against the San Antonio Spurs on November 20, 2017, and two days later, he made his first career start against the Los Angeles Clippers. In that game, scored 14 points, 10 rebounds, 3 assists, and 4 steals. In what turned out to be an impressive season, Collins was injured twice. Firstly, a shoulder injury and then an ankle problem and he missed a total of eight games as a result of that. He ended the season averaging 10.5 points and 7.3 rebounds, 57.6 % shooting and had 11 double-doubles. Collins was also named to the NBA All-Rookie Second Team. Frequent relocation is an inevitable part of the military. At just one-year-old, Collin’s family was separated as his dad was sent to serve in Washington while the newly born Collins was in Utah with his mom. At three years old, his mom moved with him to Turkey upon receiving special orders. When the 9/11 attacks happened, Collins was sent to live with his family in the Virgin Islands. The family then reunited in Washington where they lived for about 9 years before their parent’s divorce saw him relocate with his mom to Florida. Young Collins, due to his mom’s military job visited countries like Cyprus, Greece, and France. Prior to the 2017 NBA Draft, Forbes predicted that John Collins could be signed to a two-year contract worth $4,236,000 and they were almost spot-on. Per Spotrac, Collins earned a base salary of a little over $2.2 million in the 2018/2019 season. 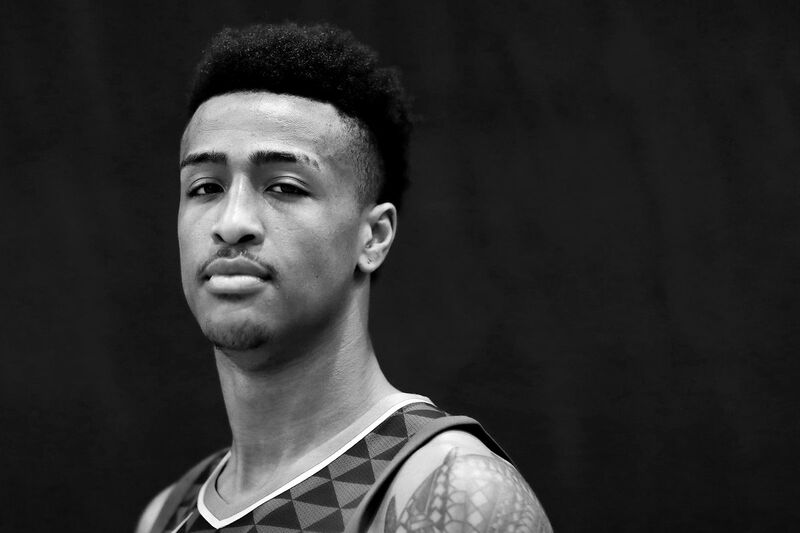 According to his player profile on the official website of the NBA, John Collins stands at 6 feet 10 inches tall and weighs 235 lb. Collins has named a few players whom he loved watching while growing up. Some names he mentioned included Dwayne Wade and Kobe Bryant. Collins has revealed that even as he stands at 6-foot-10, it always felt like he did not grow during the winter but did so during the summer months while growing up.